Still gotta wrap this in plastic and seal it up as much as possible to insulate it, but here is the exterior aquarium as of yesterday. Running a 300 watt heater that I am sure works, and a 300 watt heater that might work to heat things up, it may be slowly warming. 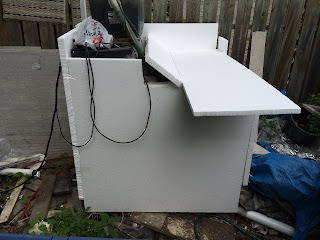 I may use the end of some spray foam cans to seal and glue it all together. I plugged the power meter into the downstairs tank on Sunday at 5pm, so in one week I will be able to estimate the per-week cost of running this setup. 20kWh week inside, and fish have been moved!